We will depart in the Australis Expedition Cruises on crossing the Strait of Magallanes, disembarking in zodiacs in the Ainsworth Bay and Tucker Small Island, navigating the principal artery of the Beagle Chanel to the Glaciers Avenue and visiting Wulaia Bay and the Biosphere Reserve declared by the UNESCO: Cape Hornos. Finally, we will get to our destination port, Ushuaia in the big island of Tierra del Fuego. Cruise through the Patagonia, navigating the Beagle Channel from Punta Arenas to Ushuaia, by crossing the cold Strait of Magallanes waters. This circuit is the longest one which is made by Australis Cruises. The voyage starts in the Southern Patagonia by embarking in the cosmpolitan city of Punta Arenas, Chile. From there we will start this trip until the southern city of America, Ushuaia in the "fueguina" province of Argentina. The city of Punta Arenas is also known as "the capital of the chilean Patagonia". This city is famous because of the Port in which we will embark, that is the most southern in the chilean region and South America. Apart from the fact that it includes one more day of navigation, this program has a different itinerary. During the second day of navigation, we will arrive to Seno Almirantazgo, and then we will descend to Marinelli Glacier in the Ainsworth Bay which is located in the Darwin mountain chain. The Seno Almirantazgo is a Fjord which glacier´s origin took place in the quaternary period. There are several colonies of sea elephants and we will be able to see the impressive Darwin mountain chain. We will continue the navigation route with the Australis Cruises and we will get to the main artery of the Beagle Channel until we get closer to the Pía Glacier which is located in the bay with the same name. This snowdrift is a big frozen wall which reaches to more than a hundred metres high in its front, and it starts to decline in certain parts which generates landslides. This very same day, we will get to the famous "Glacier´s Avenue" (Avenida de los Glaciares) in the northwest point of the Beagle Channel. There are beautiful mountain glaciers in the Darwin mountain chain to their sides: Germany, Italy, France, Netherlands, Spain and Romanche. 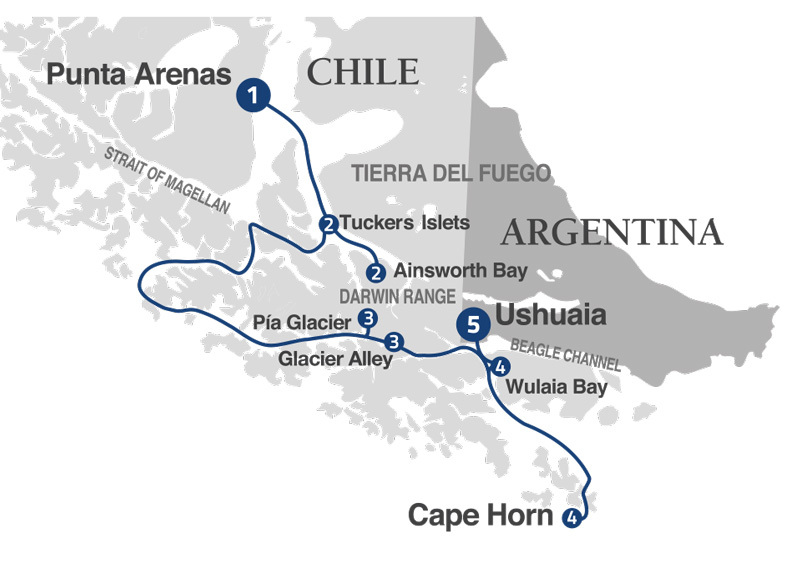 In our fourth day of the navigation route, we will be descending in the most southern cape of Tierra del Fuego, Cape Hornos, where we will visit its National Park with the same name. Finally, Ushuaia will be waiting for us. Cape Hornos was one of the main objectives of the ancient sailings which wanted to commercialize around the World, even when its Waters were well known as extremely risky to navigate, because of their intense winds, strong waves and huge icebergs. By the afternoon, we will make the check in at Punta Arenas, so then we can embark in one of the ships of Australis Cruises: Mare, Via or Stella. The city of Punta Arenas is also considered as "the capital of the Chilean Patagonia", it is also famous because of its port in the south limit of Chile and point of South America. Our journey starts on going to the southern city of the World: Ushuaia, where we will cross the Strait of Magallanes, Cape Horn and finally the famous Beagle Channel. This famous pasaje which joins the Pacific Ocean with the Atlantic, the largest water mass in the Earth, is the very well-known Strait of Magallanes. This way is located in the south point of South America, in the middle of Tierra del Fuego province and varied islands of the Pacific Ocean, and the chilean Patagonia. Cape Horn, the most southern region of the southamerican continent, delimits the Northern point of the Drake Passage, which is a sea that separates the american continente from the Antarctic Peninsula. The Beagle Channel is a sea way which was origined by several stages in the quaternary glaciations period, ruled by the sea some years later. The Channel is surrounded to the north by the Big Island of Tierra del Fuego and other islands on other points like the Stewarts, O´Briens, Gordons, Navarinos and Nuevas, among others. Among those many bays, the Ushuaia´s Bay highlights, where our final destination city takes place: Ushuaia. We will start our second day of navigation on board of the Australis Cruise at dawn, now we are close to Seno Almirantazgo, a fjord which is located in the west coast of Tierra del Fuego. Between the important sea biodiversity and underwater we will be able to sight sea elephants and black - eyebrow albatrosses. Then, we will do the first descent in the Marinelli Glacier, Ainsworth Bay, the largest glacier among those which come from the Darwin Mountain Chain´s Ice Field. This giant of ice will surprise us with its ice walls about 40 metres high. This is the place where we will do some hiking so we can sight varied fauna and nature from the Magallanes woods: dams built by beavers and a great quantity of sea elephants which constrast with the amazing landscapes. Later on, we will go to Tucker small island, a certain point which delimits the northwest of the Whiteside Channel. The region has become now into a very valuable territory thanks to the natural nutrients which gave origin to the wonderful fauna that we will be able to watch. We will navigate in zodiac boats so we can appreciate the presence of several sea birds such as cormoranes, chimangos, skuas and Magallanes penguins, among others. If we cannot sight penguins, due to the end of the reproduction period in April, we will do an alternative route to Brookes Bay, where we will disembark so we can do a trekking in the area around the glacier. This big depth bay reaches its highest point in the Darwin Mountain Chain. It is a very famous bay because of its several waterfalls which are formed in their cliffs and impressive mountains´ elevations. During the hiking, we will be able to enjoy its floral and nature beauties which hide in the woods. We will come across ñires, a tundra region, southern dolphins, cormoranes and otters, among other species. During our third journey, the route card in the Australis cruise will guide us to navigate through the main arteria of the Beagle Channel, we will get into by the northwest side of the Pia Bay chanel, so then we can make a descent in the glacier which has the same name. This snowdrift introduces in the Darwin mountain chain and it drains by the Waters of its bay. We will continue our crossing on the Australis to the northwest of the Beagle Chanel so we can gaze at the amazing "Glaciers Avenue" which is a narrow way in the Beagle Chanel where we will be able to watch many spectacular ice tongs that descend from the Darwin mountain chain to the sea. The name for this way was in honor to the glaciers which are particularly located one beside the other and very short distance between them to navigate. Those glaciers are: Germany, Italy, France, Spain, Netherlands and Romanche. During the journey we are still on board the Australis cruise, navigating the Beagle and Murray Chanel, so then we can try to disembark (if weather conditions allows us to) and appreciate the nature beauties in the National Park Cape Hornos. We can notice our arrival to this southern point once we will be able to see a 400 m high hill. This place delimits the most distant group of "fueguinas" islands, the most southern point in South America. It is also the point which delimits the northern extreme of the Drake Passage, a sea that divides the american continent from the Antarctic Peninsula. The National Park, located in the "End of the World", has been declared in 2005 as a Biosphere Reserve by the UNESCO. During sunset, we will disembark in Wulaia Bay, current archeological place that was home for one of the most magnificent tribes in the region a long time ago: the Yámanas. It was in this very same bay that Fitz Roy, who discovered the Beagle Chanel, found the main Anglican mission with the famous english naturalist Charles Darwin. During our tour on the bay we will have the opportunity to value its exquisite flora and its geography. We will do a trekking in the "magallánico" woods which will be waiting to show us many floral species such as lengas, coihues, fern among others, so then we can arrive to a viewpoint where we will be able to gaze at a wonderful and unforgettable view. In the morning we will disembark in the City of the End of the World, Ushuaia. Required costume: Trekking or hiking boots are required for all passengers.